A good number of developers and service providers rely primarily on traditional monetization models such as display Ads. However, with its apparent disadvantages, developers and providers are readily interested in rethinking their monetization strategies and looking to take advantage of blockchain computing on incentivizing user’s computational resources. The need to monetize content has been present since the advent of the digital era, but compromises has had to be made on service quality and price sensitivity. Sleekplay is in the marketplace to reinvent content monetization with a solution. 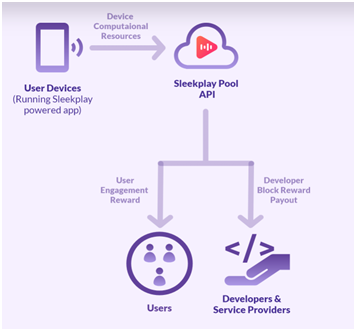 Sleekplay is a new blockchain-based content monetization solution that harnesses the computational power of devices to reward users and profit developers. The SleekPlay platform leverages the power of blockchain computing to create value from the time you spend engaging with applications. Users – Downloads and consumes content on SleekPlay-powered apps, games or services and receives incentives for their engagement. Developers & Providers – Integrates with the SleekPlay platform to provide value to their users, while converting user engagement into revenue. SleekPlay API – Handles the distribution and sharing of rewards and payouts to users and developers alike. Ad Free Experience – Users can experience their favourite applications without ad interruptions. Play & Earn – As users enjoy their favourite streaming apps and games, SleekPlay rewards them with SKP. Accrued SKP can be exchanged for digital goods or cash. More revenue than ads – Because of our goal system and incentives, developers earn more per user than with ads. Positive experience – As mining eliminates the needs for ads, developers can deliver quality services and protect their brand equity. Better User engagement – Due to the unique SleekPlay goal system & user incentives, users engage more with applications, increasing revenue and conversion metrics. Competitive edge – Applications integrating with SleekPlay attract more users than the competition, with the allure of earning SKP coins. Completion of Private round; Marketing the Pre-ICO. Releasing the web wallet manager; Completion of Pre-ICO; Marketing the Main ICO; Completion of Main ICO. SKP on exchanges; Release of GUI Wallet. Release of Sleekplay API with web miner Integration (beta); Closed testing with specific developers. Full release of API with native miner (beta); Open developer signups. Launch of the Sleekplay Platform; Creating awareness to increase SKP adoption; Further development of the Sleekplay platform. SleekPlay harnesses the power of Blockchain computing to create a Unique monetization model that is profitable to developers and users of the network. The platform makes it possible to replace ads with a blockchain based approach. SleekPlay is providing a great solution to this multi-billion-dollar content monetization market and has a great potential to attract a lot of investors. The private round of ICO has already started and it’s doing a marvellous job. Compromising on the great concept, analytics, roadmap, and team; SleekPlay will be the next big thing in the market for content monetization.